What a nice place to talk San Fernando Valley history - Puro Sabor at 6366 Van Nuys Boulevard. I had a great "pechuga de pollo a la Parrilla" grilled chicken breast, fries, good rice and a lunch-sized salad - just $ 10.95. Our host introduced himself as Olivier. 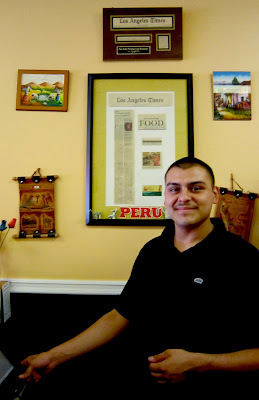 Our host at Puro Sabor, Olivier.